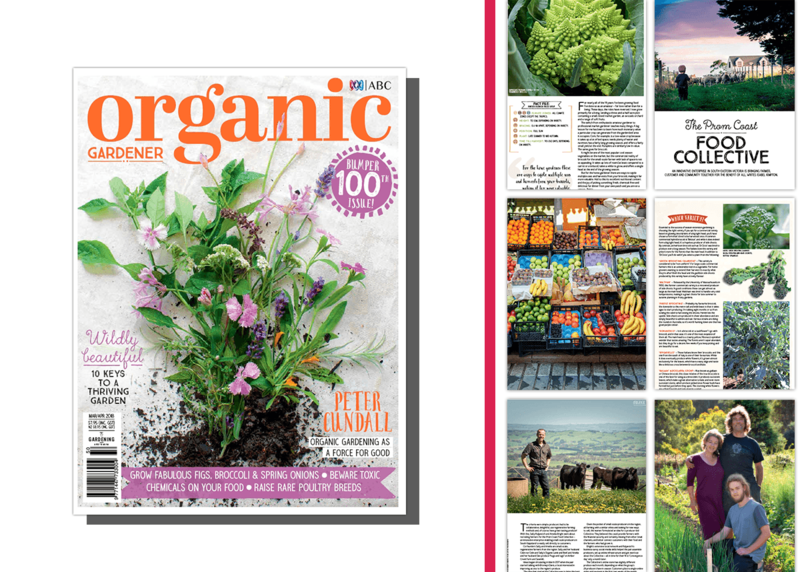 With the release of its 100th issue, we speak to ABC Organic Gardener editor Steve Payne who gives seasonal advice on growing fruit, vegies, herbs, poultry and much more! Can you describe ABC Organic Gardener? Who is it for and what does it cover? Organic Gardener’s main aim since inception has been to give practical, down-to-earth advice on how to grow healthy food organically. But we also embrace a whole-life experience, bringing in environmental stories, health, community, food and wine. When we started in 1999, organic gardening and food, although well established, was not mainstream so there was also a lot of awareness raising to do about the value of certified organic food and the benefits of sustainable farming. Now a lot of those ideas are accepted. There has certainly been a new wave of interest in growing your own food, and a mini-revolution in farming with young people moving back to the land to be market gardeners. So we are telling the stories of those growers and hopefully providing support and inspiration. Our readership is across all age groups (slanted towards women), but with an increase in the 20–30 age bracket in recent years. What’s the best part of being the editor of ABC Organic Gardener magazine? One thing I’ve never lacked as editor is a multitude of good stories and ideas to fill the pages. So the greatest pleasure is working with the editorial team and writers each issue to fill the pages with a diversity of stories and ‘ingredients’ to produce a satisfying and worthwhile read. On the broader scale, being able to tackle big environmental issues such as climate change and chemical contamination of food, means we are changing attitudes and hopefully policies. It is probably the article ‘What’s on my food’, by Malcolm McGuire, which tells the story of how pesticides have become so prevalent in our food production system since the 1950s and investigating just what is being sprayed on crops today. Some of the chemicals used in Australia are banned overseas and there can be hundreds of chemicals registered for use on any one crop. We also look at which are the worst offenders (apples or strawberries anyone?). On a positive note, the story about the Victorian Prom Coast Food Collective is another favourite. It looks at a group of producers, from lamb to honey, who sell as a collective online direct to families and individuals. It’s a new way of marketing organic produce and is wildly successful. What are your top picks of what produce to grow this season for keen gardeners? In the upcoming cool season, you can’t beat brassicas (broccoli, cauliflower, kale). They might take up a bit of space and take time to mature, but get started early and you’ll have a wonderful home-grown harvest. This issue we talk about choosing broccoli varieties that give multiple harvests, meaning ones that produce more side shoots and florets once the main head has been cut. Oh, and you can eat the flowers and leaves of broccoli. Asian greens such as bok choy are also tasty, simple and fast to grow if you want an easy stir fry addition. What are your top favourite plants to grow in your garden? My favourites are ones I use a lot and seem to succeed year after year. Plenty of gardeners will tell you that some crops just never seem to take off under their care, while others flourish. Snow peas are a sure-fire winner for me and great for school lunches or just munching straight off the bush. Make a trellis out of two star-pickets with mesh or wire between, plant the snow peas and watch them take off! Herbs are also fantastic – I couldn’t be without a few basil plants in summer to pick leaves fresh for pasta or to make pesto. Everyone loves tomatoes, but they can be a challenge in my subtropical climate, so we tend to go for cherry tomatoes that don’t succumb to fruit fly or wilt (or grow them in winter). But there are lots of new heirloom varieties being sold now, and colours from black to purple, yellow to the traditional red (or even the Green Zebra, which is as the name suggests – green with stripes). Oh, and Rainbow Chard looks fantastic in any garden with its red, yellow and orange stalks. What can readers expect from future issues of ABC Organic Gardener? In the early years we had a strong focus on the chemicals on conventional produce and how to avoid them, so we are heading back in that direction raising awareness of the arsenal of dreadful chemicals still being used, and also the dangers of genetically modified food. The more food everyone grows themselves organically, the better they and the planet will be. We have recently introduced a regular section featuring gardeners we have spotted on Instagram who are doing fantastic things and inspiring others, so we are going to expand that, including more stories on the people behind the gardens. If ABC Organic Gardener had a motto what would it be? Grow your own and live to be 100!